Most people don’t think about renovating their bathrooms but there are many valuable reasons to start! A common repair issue is usually fixed right away but what about the issues we don’t catch? You don’t have to break the bank when it comes to bathroom renovations. Redoing the entire bathroom from tub to tile can become a huge money pit, but this is because a lot of homeowners feel they have to overhaul the entire room. Sometimes, it only takes a few key elements to completely change how you see your bathroom! If you’re looking to give your bathroom a new look, take these five renovation ideas into consideration. We’ve all been there. Renovating a small bathroom to give some new life to a very important room in your house. After a few days, you’re feeling like you’ll never actually be able to fit everything in such a small space. If your bathroom redesign is stuck in a rut, then these ten helpful ideas are meant for you! The trick to opening up your small bathroom is to choose your desired colour focus, go to a local paint store like Dulux and ask about matching palettes and related tones to that focus colour. Then deploy those contrasting tones by painting one or alternating walls or by choosing subtle decorations in those colours. If done correctly will give you a modern look and pop of colour for your redesign. It’s no surprise that storage is the main problem when it comes to having a small bathroom, so you have to think hard about affordable and creative solutions. Open shelves and built-in storage cabinets on the walls not only give you more storage area but can also make the room feel larger and less cluttered. The oldest trick in the book to making any small space bigger is to add a mirror, and you can’t go wrong with getting a large, dramatic one. Look for mirrors with decorative frames or with borders that fit the matching tones of your focus colour. A new way that you can add to the space illusion is to make otherwise sharp edges, curved. This goes for sinks and the side of the bathtubs. Larger and artfully planned sinks and countertops in a small room will also give you more counter space. Modern bathroom vanities range in style from traditional wood cabinets to poly-marble tops for single or double sinks. Do your research or check out our vanities because this can make or break your space. If the sink counter is already flooded with care products and other necessities, one great tiny bathroom idea is to install a small floating ledge above the sink to hold more of your items. You can also punctuate a floating ledge with stylish decorations or small framed pictures that exaggerate your colour palette. Keep the Bathroom Floor Going! 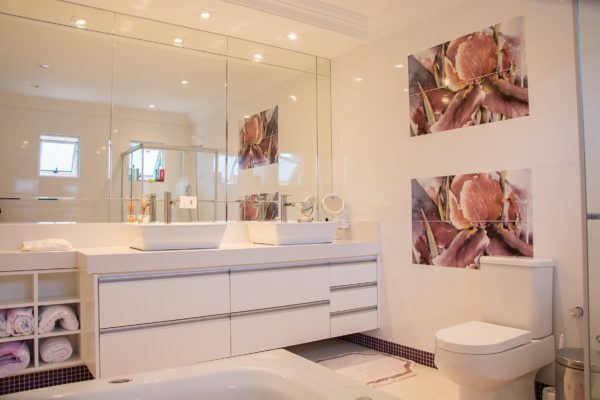 To add more illusion that you have a big bathroom, keep your floor going up to the shower area. Choose the right flooring for your budget and decor and don’t be afraid to show it off! Don’t cover up your flooring with storage units, towels or large floor wastebins. A curtain is the cheapest and easiest way to divide the shower from the rest of the room but, depending on the design, they can get dirty and deteriorate quickly with use. A plastic or fogged glass divider is a little more expensive but can add a tonne of class and a luxury aesthetic. However, if your bathroom is extremely small it can make the space even smaller depending on the material and the colour you choose. It all really depends on your budget and your materials so make sure you put the time into research and pricing! Traditional hinged doors also take up space when opened. Sliding doors, on the other hand, will always be parallel to that wall meaning that it will not intrude your bathroom’s space at all. The construction materials and designs for sliding doors have recently become super affordable and minimal making it an easy decision for your next remodel. You can never go wrong with having plenty of natural lighting in your bathroom, and if mixed with an awesome colour scheme, you’ll be in awe of how airy, open and relaxing your bathroom can look. It also gives you the opportunity to place small living plants or flowers on a ledge or storage space! One of the simplest ways that you get away with a beautiful bathtub in a small bathroom is by setting up the showerhead and tub combination in the same corner. Choosing a matching trim and showerhead can add plenty of modern style to this setup. Excited to put some of these ideas into action and transform your small bathroom? 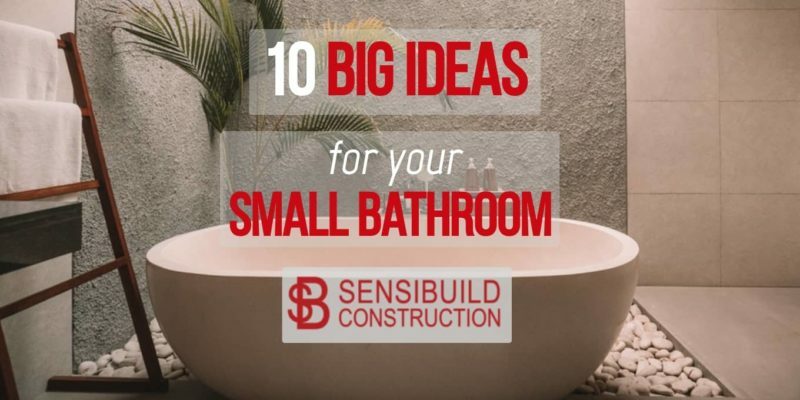 Get started today with some help from the renovation experts at Sensibuild who specialize in bathroom designs and remodeling in London, Ontario!